The Devoured Culinary Classic is the region’s premier annual culinary event presented by Local First Arizona, Devour Phoenix, Phoenix Art Museum, and the Southern Arizona Arts and Cultural Alliance. The Devoured Culinary Classic showcases the fine food and drink producers and purveyors of Arizona while furthering metro Phoenix as a dining destination worthy of international culinary prestige. 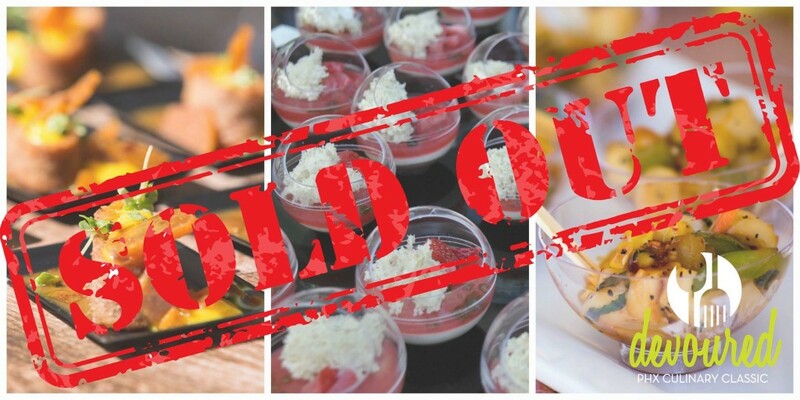 As of 11:00 a.m. on Thursday, January 21, all General Admission and VIP tickets for the Devoured Culinary Classic have sold out. Phoenix foodies who missed out on tickets to the Devoured Culinary Classic can still enjoy the festivities of the expanded Devoured Week of events including the Devour Phoenix Bartending Competition, 7 Chefs Singh Along, and Palette to Palate. WHAT: A showdown between nine of the Valley’s best bartenders to see who can come up with the best cocktail using local spirits from Arizona Distilling Company. Tickets include cocktail samples as well as craft spirit samples and the ability to vote for your favorite cocktail. WHO: Round 1 contestants include: Joshua James of Clever Koi; Michael Soo of Crudo; Rob Moore of Windsor; Andrew Gilchrist of Hula’s Modern Tiki; Rachel Velasco of Joyride Taco House; Tanner Lips of The Henry; Zach Smith of Welcome Diner; Robert Porter of Thirsty Camel; Dustin Bolin of Melinda’s Alley; Titus Fauntleroy of St. Francis; Jillian Newman of Desoto Central Market; Mitchell Lyons of Rum Bar at the Breadfruit; and Brian Goodwin of The Gladly. The nine bartenders with the most votes at the conclusion of online voting on January 29 will move on to compete in the final event on February 28. Finalists will be announced on February 1, 2016. TICKETS: Tickets are $40 each and available at http://devouredphoenix.com/tickets/. Attendees can purchase a combined tickets package to attend both the Devour Phoenix Bartending Competition and Palette to Palate for $60. WHAT: The Seven Chef Singh Along is the fourth culinary event organized by the Arizona Seven, a collection of top Valley chefs dedicated to raising awareness of our world-class culinary scene and hopefully bringing the James Beard Award back to Arizona. During the wine-paired dinner, each chef will prepare a single course that highlights both their distinctive style, and the bold flavors of Arizona. WHO: At the Seven Chef Singh Along, this chef septet will feature Cullen Campbell (Crudo, Okra), Kelly Fletcher (El Chorro), Josh Hebert (Posh Scottsdale), Scott Holmes (Little Miss BBQ), Stephen Jones (The larder + the delta), Bernie Kantak (The Gladly, Citizen Public House) and Gio Osso (Virtù, Nico). TICKETS: Tickets are $125 + $35 tax and gratuity ($160 Total) and are available at http://devouredphoenix.com/tickets/. Only 150 tickets are available. WHAT: An event that blends the visual arts and culinary arts by pairing chefs and painters to interpret each other’s work for a show that is at once unique and insightful into the worlds of the two artists. The evening will feature Arizona wines and award winning chefs, paired with regional artists who will be carefully selected and who will prepare new works for the event. WHO: Artist and chef pairings include Casebeer paired with Chef Silvana Salcido Esparza of Barrio Cafe; Jesse Perry paired with Chef Josh Murray of ICON Lounge at the Renaissance Phoenix Downtown Hotel; Leo Bianco paired with Chef Chris Bianco of Pizzeria Bianco; James Angel paired with Chef Justin Beckett of Beckett’s Table and Southern Rail; and chef Stacey Carson of Arizona Wilderness Brewing, artist pairing to be announced shortly. More information about the Devoured Culinary Classic can be found at http://www.devouredphoenix.com.